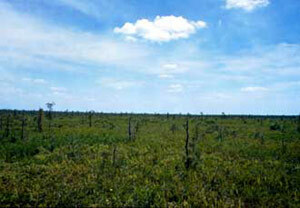 The United States Congress designated the Pocosin Wilderness (map) in 1984 and it now has a total of 11,801 acres. All of this wilderness is located in North Carolina and is managed by the Forest Service. Native Americans called it a pocosin, which in their language meant "swamp on a hill." A more accurate assessment of this seemingly flat area that rises slightly in the center might be "raised bog." Over thousands of years, organic matter (basically black muck) accumulated to form a pocosin, an area highly acidic and deficient in nutrients that produces a unique biological occurrence. The thickness of the muck varies from several inches at the edge to several feet at the center. Growth on the outer rim is typically pond pine with a dense understory of titi, the shrub Zenobia (unique to pocosins), and an impenetrable jungle of greenbrier vines. Toward the center of the waterlogged goo, trees thin and grow more stunted, and shrubs and vines diminish, their tangled roots providing the only footing. Thus you'll find the trailless Pocosin Wilderness in Croatan National Forest near the coast of North Carolina. People come to see the flora (no other national forest boasts the insectivorous Venus flytrap) and fauna, but there is no place to camp or even easily hike through the muck. Avian life abounds here on the Atlantic Flyway, with many water-related birds, hawks, owls, woodpeckers, and flycatchers. Biting insects also thrive, along with alligators and poisonous snakes. Planning to Visit the Pocosin Wilderness? How to follow the seven standard Leave No Trace principles differs in different parts of the country (desert vs. Rocky Mountains). Click on any of the principles listed below to learn more about how they apply in the Pocosin Wilderness.